Medical service is a highly demanding business all through the world and serving people has been lot easier through the use of technology. A perfect website of a medical service provider actually brings the service to the doorstep of the people. A smart and user-friendly HTML website can meet all your needs as a medical service provider. 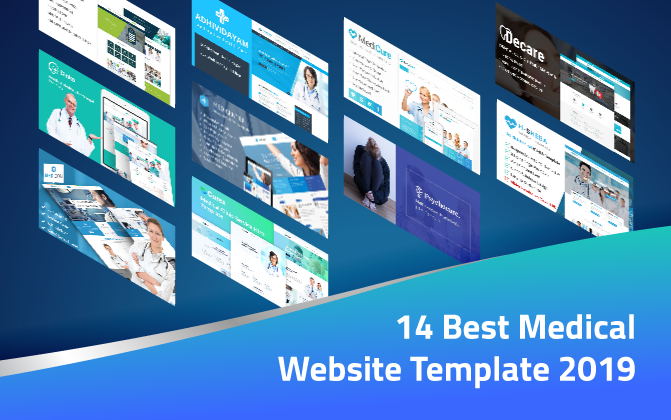 No matter, what kind of medical service you are providing, all kinds of specialized HTML Bootstrap 4 templates are here in this exclusive blog on Best medical website template. A majority of people today search medical information in the internet. So, you cannot ignore online. 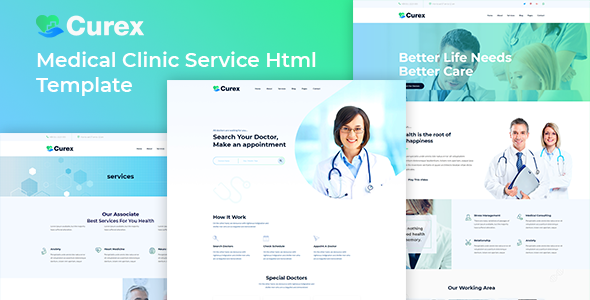 Curex is a modern and clean HTML website template for providing healthcare service. You can build high quality online home for any clinical, hospital, doctor, or any other medical consulting service. However, Curex, 100% responsive template comes with some exclusive features like 10+ HTML Pages, 3 Blog Pages, Doctor Appointment Form, Material Design Icon Fonts, W3C Validate Markup and many more things. Make a short visit to this template and see the majestic quality of this item. I have been stunned to see the design and attributes of this template. So, you can at least visit this template thoroughly that will help you get an overview or example of a perfect medical website template. 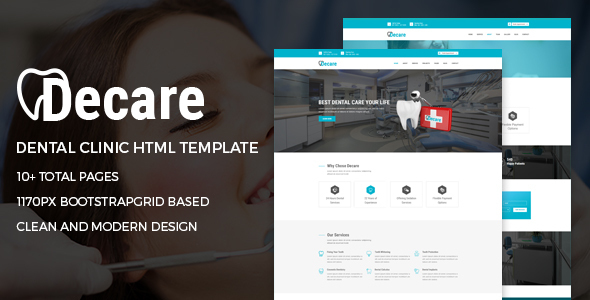 If you are looking for a smart and responsive HTML template for building a website for your Dental Practices, Health Clinics, Dental Hygienists, Dental Clinics, Orthodontists, Endodontists, Doctors etc. Decare is powered with valid HTML5, CSS3 and Bootstrap. Moreover, it has 10+ HTML pages including 1 Homepage, Dynamic Contact Form, Well Documentation, Google Font and many more useful attributes. In addition, Decare has Cross-Browser Compatibility and fully responsive layout. These two awesome features have made it possible that the website will fit to any kind of device and browser. Having such efficient website you won’t have to bother about the maintenance of the site. Rather, you will be able to focus on serving your clients. Today, medical service providing is getting digitalized. So, Medicals, Clinics, Diagnostics, Doctors Chambers, are connecting their clients through internet. Yes, the digital gateway of providing medical service is getting a huge response from the clients. Binke is a stunning HTML template to build an online home for providing all kinds of health related service. The pixel perfect design of this template has smooth animation as well. Binke Bootstrap template has 17+ premade HTML pages including 2 different home pages. It provides plenty of other features like Smooth Animation, Dynamic Contact Form with Ajax, Fast Page Loading Option, Google Fonts, Font Awesome, Clean Markup, Icon-font & Pe Icon 7 Stroke Icon Fonts, SASS, and Responsive Video. Don’t think that this list should contain templates for building websites for the conventional Hospitals only. 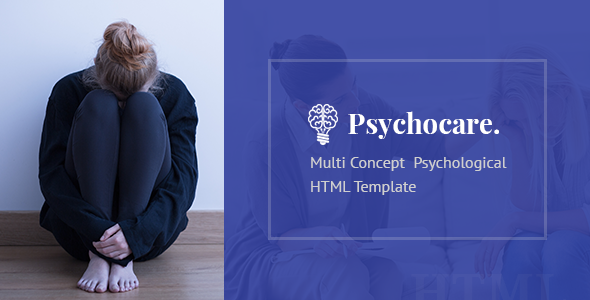 Here is a psychology HTML template for setting up a modern Counseling and Psychology center. This template provides responsive, fully documented, neat & clean design for the users. Psychology clinics individual psychologists, psychology firms, hypnotherapy specialist, psychiatrist, personal coach / trainer, psychotherapist, as well as psychological medicine related websites will best suit with this template. To serve the psychology patients Psychocare is ready to meet your need. 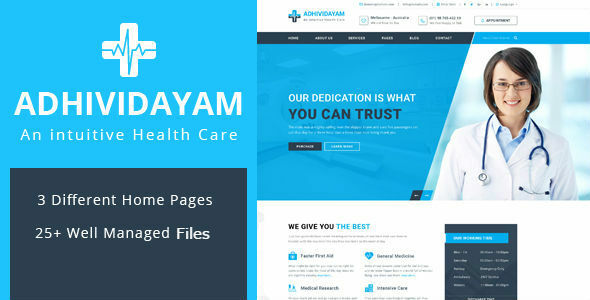 Medicore is a graphically polished and functionally efficient HTML template for Hospitals, Gynecologist, Small Clinics, Dental, Pediatric, Therapists and other medical service related website. However, Medicore provides 3 unique home versions. Interestingly you can mix up all the home pages. Medicore has valid HTML5 & CSS3. This neat, clean and simple design of website template doesn’t lack in useful features. In addition, other features like Responsive Layout and Cross- Browser compatibility have been prioritized in this template. Well commented HTML and CSS3 files, Dynamic Contact Form and many more attributes are there in this template. The visual output of this template is excellent indeed. So, take this medical website template soon. 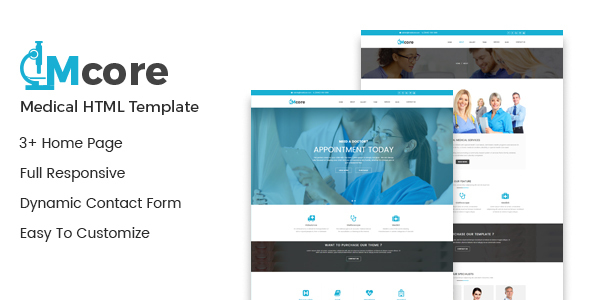 DrPoints is an extensively-built HTML template for Dental, Care, Clinic, Medical, Corporate, Doctor, Dentist, Pharmacy, Health, Health Care, Hospital, Fitness, Professional, Medicine Website. To describe in detail, I should say DrPoints is a Cross-Browser Compatible and fully Responsive template. It perfectly suits with any kind of device size and browser. In addition, DrPoints is a vast and elaborate healthcare website template. This colorful template is designed very carefully to insert every necessary option that a visitor may expect while browsing for getting a medical service. 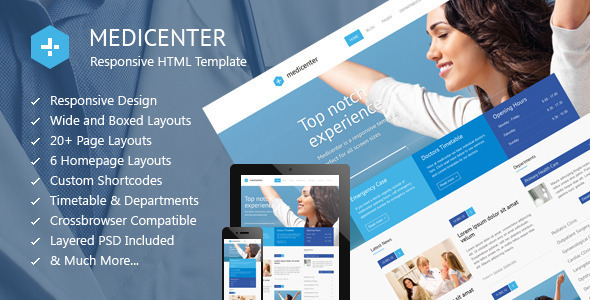 MediCenter is a smart and responsive HTML template specially designed for Doctors, Medicine Corners, Clinics, Hospitals and other health related institutions. However, you can use this template for Spa, Health Care, Veterinary, Gym etc. MediCenter has Timetable Responsive Schedule Plugin, Pages with Wide and Boxed Layouts, 6+ Home Layouts. In addition, MediCenter brings an excellent collection of Shortcodes, 50+ Icons and other powerful attributes. MediCenter contains PSD source file as well. Health is another splendid HTML website template. If you are starting a Medical service, Clinic, Pharmacy, Pediatrician, Stomatology, Psychiatrist and anything related to health, you can choose this template with no hesitation. Besides, this template has perfect color combination, Creative Arrangement of Options and High class Functionalities. Choose this one if you have this relevant purpose or if you are finding for a medical website template. 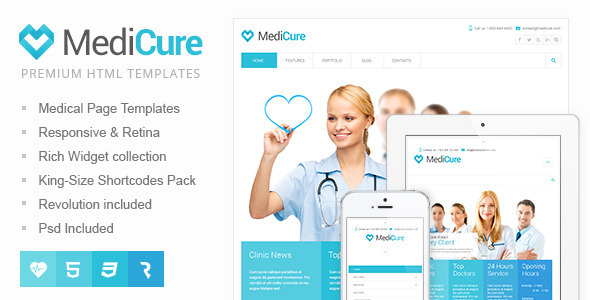 MediCure is a dedicated template to bring a perfect solution for the medical and clinic websites. Along with the compulsory features Medicure brings some exclusive functionality. 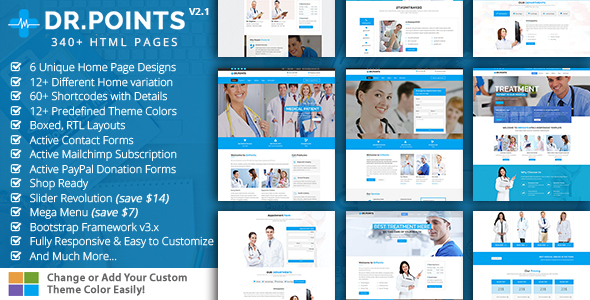 However, you can display the medical services of any kind of medical, clinic, hospital or health institution using this HTML template. Thankfully, a large set of Shortcodes is available that you can use to build powerful & unique contents even if you are amateur in this arena. In addition, you will find highly SEO friendly code, CSS3 and valid HTML5 in this template. Check the demo and install it soon. 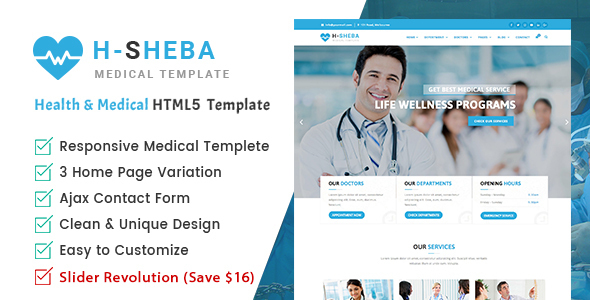 Health Sheba Hospital is a complete and comprehensive HTML template for Hospital Business. Health Sheba Hospital is a minimalist medical website template which has modern and clean design.The other attributes of this template are Responsive Layout, Cross-Browser Optimization, Clean and Professional Design, Easy Customization, Google Map, Google Font, W3C Validation, Font Awesome Icon, Contact Form and Well Documentation. Health Sheba Hospital is designed with the idea of real time experience of some expert in this industry. You can easily trust this template to make serve people in a better way. 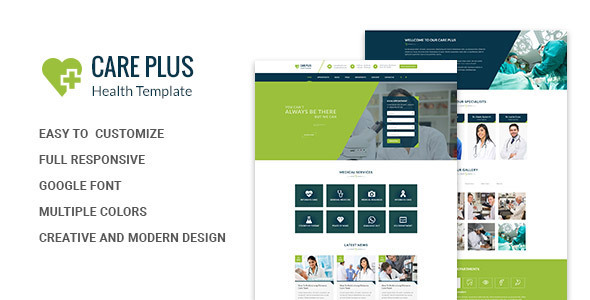 Health CarePlus is a fully responsive HTML template for Medical, Dental, Clinic and Community Clinic service etc. Extended facility of this template is it comprises a detailed documentation package for the user’s comfort. Moreover, Health CarePlus is powered with Bootstrap, CSS3 and HTML5. All the must-have options like- Blog Pages, Appointments, Appointment Table, Testimonial, Services, Team, Shop Pages, Price Table, About Page, Newsletter pages are organized smartly in this template. On the other hand, it provides SEO Optimization, Slick slider; Contact Form, Twitter Flickr, Strong Gallery and what not? Medicom is first of all a creative HTML template. 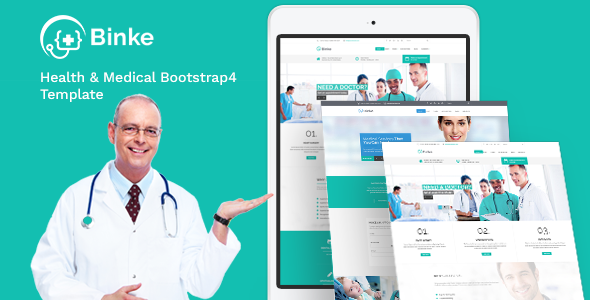 This Bootstrap 3 template, CSS3, and HTML5 template is suitable for Hospital, Clinic, Dental Care, Medical Center and Health Service Provider. This exclusive template has probably covered all the necessary aspects of a medical website template. It has Working Ajax Form, W3C Validate Markup, Retina Ready, Wide and Boxed Layout, Google Web Font, 8 Color Variation, Parallax Scrolling Effect and Well Commented Code. Besides, Medicom includes 4 unique Homepages, Drop-Down Menu and Mega Drop Down Menu. 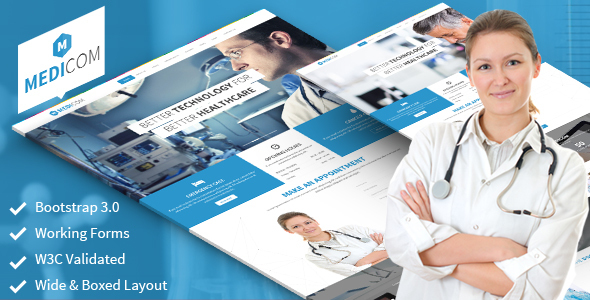 Medical Pro is a professionally designed and developed medical HTML template that you can build your medical website with. Medical pro focuses the industry of medical service Dental, Medical, Clinic, Medicine, Fitness, Hospital, Surgeon and other health related websites. 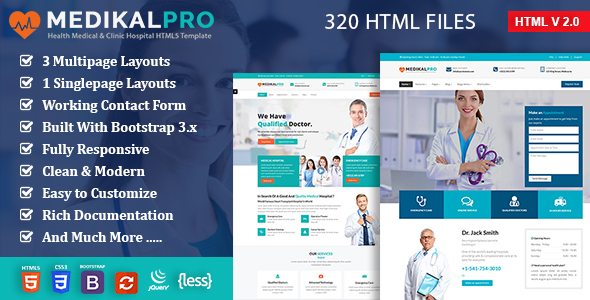 Medical Pro is a feature rich medical HTML template. For example, Medical Pro has Revolution Slider, Responsive Megamenu, Font Awesome 400+ Icon, 7 Stroke 200+ Icons, Ajax Contact Form, Parallax Section, Powerful Shortcodes etc. After all, Medical Pro has widely covered almost all the desired functionalities. You can depend on this rich template unequivocally. 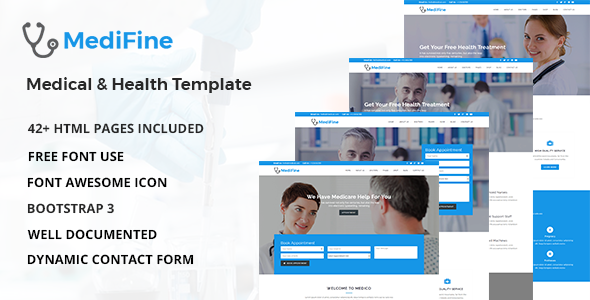 MediFine is a fully responsive HTML5 & CSS3 template for building website of Hospital, Dentist, Clinic, medical & health. This nicely designed template has smart code inside it. However, MediFine also is packed with features like – 5 Home pages, Multi Header style, Department & Time Table Support, Bootstrap 3, Parallax Background Effect, Fully Integrated Font Awesome Icons and well documentation. In addition, MediFine is neat and clean and smart to look at. To bring an elegant outfit, MediFine is second to none. In the end, buy the best item from here. Don’t get confused to buy any template .Here you may find both the minimal to big and simple to gorgeous templates at the same time. Take your one and start working for the humanity.